Here's what some of the amazing clients of James McLaren Fitness had to say about their journey's. Before I started training with James I would do DVD work outs at home and try to manage my diet but I was never able to sustain anything past 4 weeks and I would give up and put all if not more weight back on. I wanted to do gym classes and workout at a gym but my self-confidence was so low I couldn't bring myself to join anywhere. Then I found James on Facebook and we meet up, had a chat and worked out what I as an individual needed. Since that meeting my life really has changed for the better and I love it! Every session I follow my own individual plan that James sets out so that we can reach my goal. In 8 weeks my body and mind has transformed into something I didn't think was possible (see picture below) not only does my body look great I also feel great and my confidence is sky rocketing. I really feel like I'm back to my happy confident self I used to be before I had my daughter 3 years ago. Every session is great fun and I do things I never thought I would be able to. Such as the gymnastics rings.... which are awesome and make me feel like I'm in cirque du soleil. I no longer rely on the scales and rarely use a calorie tracker. James has given me all the tools and support I need to live a sustainable healthy happy life. And the Facebook community he has set up is wonderful, supportive and so encouraging! I'm truly thankful to James for helping me reach my goals I love the results and look forward to every session. To anyone considering using James to help them reach their goals, whatever they may be, do it.... you won't regret it! "My mindset and condition before joining JMF was basically a non-existent responsibility to my health, body and well-being which resulted in me becoming drastically overweight, totally sluggish as a result of not having any energy reserves and I needed a change that would work and fix me. The first meeting was very informative and there and then I decided the 30-day trial had to be undertaken and that I would take one step at a time and decide on from there once completed. The chat made me feel like I could change my physical appearance, lose the weight required and tone up but it would also require my dedication to continue the training with a heavy and strict focus on my diet. My physical results are simply amazing, I look at myself in the mirror and although I haven’t reached my goal, I’ve seen massive change. I have reduced my weight from over 18 stone down to 15.2 stone in 3 months, and I’m starting to tone up which is fantastic. I make an additional attribute to the programme by walking, taking the stairs and leaving the car at home where ever possible as recommended by James, and I’ve been amazed at the additional help this puts on the weight loss and fitness side, it’s a win all the way. For anyone thinking of joining, for whatever reason, it’s the support from JMF that makes the programme successful, the guys will be with you for the whole of your journey right by your side, and it’s the reason I joined and am hitting my goals because I am literally told what to do and given the nutritional support I need, which is just great!" Before I started working with James my life diet was out of control. I was 5 months postpartum and struggling with losing and gaining the same 5 pounds. When I first met James, I was slightly nervous this guy is totally going to judge me and my bad eating habits. Thankfully he was just the opposite! He helped me to gain control of my diet without completely giving up the things I love to eat. As a nursing mother I was worried about losing my milk supply, but James was able to take that into account when working on my diet and exercise regimen and my supply was not affected! I left our first meeting confident I could achieve my goals. In my time since working with James I've not only lost 25 pounds but also have achieved a level of fitness I never thought possible before. I am not just skinner, I am fitter and so much stronger than I knew! Being a part of Team JMF has helped to get my life back on track. I am so much more confident in myself and in the process, I've made great friends too. Contacting James has been one of the best decisions I've made for my health. If you are even just thinking of getting back in shape I suggest just having a chat with James you will not regret it! “I started working out with James just over 11 months ago. Can confidently say I have not regretted the journey I have had so far. I first spotted his Wonder Woman ad on FB and filled out his form on the spur of the moment. The next day I got a call from James and we spent the next hour on the phone going over what I might need from him. The first session I walked in with knots in my stomach wondering if I had made the right decision. The next day I ached like heck and decided I had probably made a mistake! I went back anyway and as the days passed the recovery became quicker with a lot less muscle ache. Changes started to happen pretty quick. It was around a month in when we were warming up that I suddenly realised I had been touching my toes (Little miracle there have to say!). I was lifting things I would not have thought possible and moving with way more confidence. I keep getting the comment that I am not the same person I was a year ago, which says a lot I think. With the help of James, and support from the others within the group I have lost 36lbs so far. But the weight is just a by-product of how much better and full of energy I am within myself. If you are sitting on the fence wondering if something like this is for you then hop down and contact this man – He works wonders no matter what you level of fitness/mobility (or lack of as was my case)!!!!" “Before joining JMF I'd been working on trying to lose some of the extra padding I'd gained after having my two children, but I felt like I'd just started to plateau and didn't know what to do next. I didn't feel as fit as I used to and felt permanently tired juggling my work with my family. James was positive that I could achieve what I wanted around my busy schedule and after our first session and nutritional consult I did too. 8 months later and I feel fitter, stronger and more energised than I have in years. I love the sessions and can't imagine JMF not being part of my weekly routine. I couldn't do a single press up when I started, now I can press up with my six-year-old on my back! I've deadlifted 90kg, squatted with well over my body weight and I'm getting closer to my first unassisted pull up. I've lost about 9lbs without feeling like I've had to deprive myself too much and I feel more toned than I have in years. "I can honestly say that in the 4 short months I have been working with James, he has helped me change so many aspects of my life for the better. Before I started small group training I had experienced a really stressful few years, had a terrible diet, felt totally unfit and my sleep pattern was horrendous. I was prescribed sleeping tablets to help with this, but they made me feel sluggish, unhealthy and tired all day. My self-confidence was really low and I felt pretty rubbish about myself. After getting in contact with James, we arranged to meet to talk about my expectations and what I wanted to achieve. In that first meeting I didn't really know what to expect, but I was bowled over by his enthusiasm and positivity. I explained that my concern wasn't particularly about weight loss, but more about overall health and well-being. I just wanted to feel better about myself, have more energy and try and tone my body at the same time. James was very down to earth and made me feel at ease by explaining all about the different food groups in a language I could understand. He also suggested better patterns of eating, and the importance of planning ahead with meals. James said to me that he was absolutely confident I could achieve my goals of feeling better and healthier over the following 12 weeks. I left the meeting feeling really motivated and determined that I was going to put all my efforts into the sessions. I had no idea that by attending classes three times a week, I would lose weight, improve my strength and self-confidence, and feel like a different person. I am so much happier in myself as a result of attending his training sessions. I feel I am actually doing something for me, that takes me away from stresses at home and work. Those 3 hours a week have become invaluable to me. I have seen my body shape change for the better. I won't lie and say that sometimes when it's cold and I'm tired I don't have to force myself to go to the evening sessions, but I do it because every time I go I feel so much better afterwards. I can also now see my strength improving all the time, and this provides the motivation I need to stick at it. I would honestly say to anyone thinking of joining JMF to just do it. Not only have I lost half a stone but I am able to do things I never thought possible. I am so much happier in myself, my sleep pattern is totally transformed, so much so that the medication is no longer needed and I feel so much healthier because if it. James has a unique ability to be supportive without being pushy. He works at your pace, but encourages you to reach your full potential. He has even got me doing headstands which I hadn't done since I was about 4 years old! He has encouraged me to achieve far more than I ever thought possible by his calm, unflustered manner. He is always available if you have a problem or query, even if you just need some gentle encouragement. I can't recommend him highly enough! Overall, James is just a genuinely lovely guy who is behind you ever step of the way, and you can't really ask for more than that. I am a better person for taking part in this programme and even my children have noticed that I am a lot less stressed at home. It's not just been a fitness programme for me, it's been a lifestyle changer, and I can't thank James enough for all his help and support." “I play both golf and football so I had an ok level of general fitness but it wasn’t good enough to allow me to perform at my best, I had serious issues around flexibility which put me at risk of injury. I had tried going to gyms in the past but struggled to keep the commitment up after the first few months so knew that this wasn’t the answer to me increasing my fitness. I also had lost my way with regards to what I was eating so I was eating the wrong things at the wrong times in the wrong quantities. I needed to sort things out before I went too far down the wrong path. My first meeting with James we sat down and discussed what I was doing in regards to both my fitness and nutrition and what my goals where. I left the meeting feeling confident that James was going to be able help me reach those goals and give me the accountability I needed to succeed. Since joining JMF I have become fitter stronger and more flexible, I have noticed increases in performance in my sports as a direct result of this. I have also lost both weight and body fat, I am much more careful with what I eat which has massively increased my energy levels and I am no longer always tired. It’s safe to say I am thrilled with the progress I have made in the last 14 months. I now have the accountability I need to keep on track which is so important for me as I can quickly loose interest without this. I also really look forward to the sessions and really enjoy training in the small group setting. 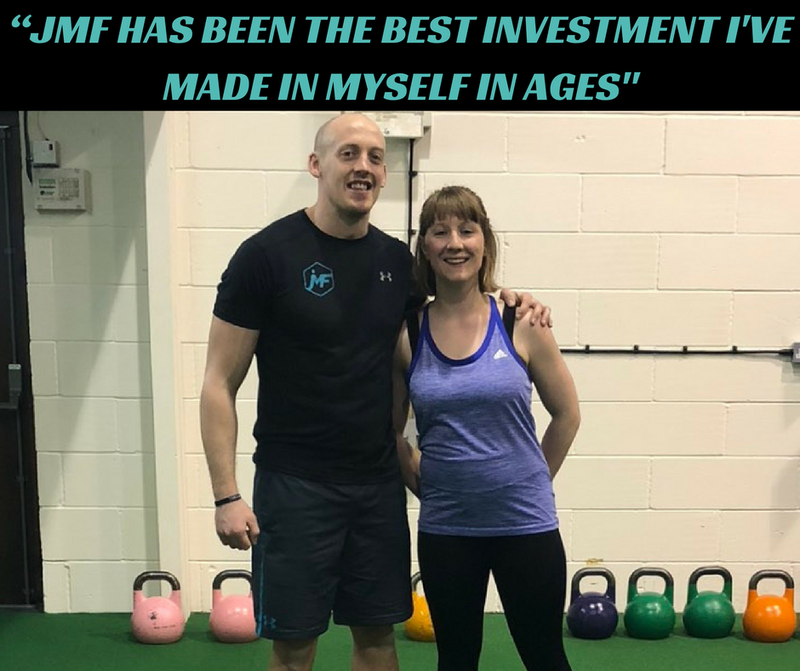 “Before joining JMF I was suffering with post-natal depression and struggling to get back into any form of fitness routine; I had in my head what I wanted to do but didn’t know how to get there. James put all my nerves to rest within minutes of first meeting him. His no nonsense approach towards fitness and nutrition aided my understanding and approach towards meeting my goals. I went home and created my meal plan for the week straight away! Within the first 4 weeks of being a part of the JMF team I was back in my pre-pregnancy jeans; feeling healthier, fitter and generally happier. And now at the end of my 12 weeks I have lost a stone! I've been training with James since October and have really enjoyed every minute of it! I've been going to the gym on and off for years, but after a few months I'd get bored and stop going. This is the longest time I've consistently kept training. I’ve been pushed and supported in doing things I would never have even thought about doing on my own and am so much stronger than I ever thought I could be. I’ve lost just over a stone and a half with James' support and my body feels so much healthier and stronger. Alongside the in gym training, he gives a lot of support outside too. Sessions are always good fun and James is always keen to demonstrate the latest dance move from MTV videos haha! Being able to train alongside other people in the group sessions is always a giggle and James seems up for taking a lot of stick in session whilst the heavy lifting is being done! the programme and learning different exercises every 4-6 weeks always has me pulling faces, but it keeps it interesting and it's good to see the progress week to week. For the first time I feel I may actually be able to reach my goals. I have been working with James for six months now, and there has been a marked change in my strength and perception of health. At my initial consultation, I had no doubts that I'd picked a good PT. He made me feel comfortable with the idea of working with him straight out the gate. Even at my perceived best working out solo, I STILL couldn't manage a single pull-up and so set a simple goal: one single pull-up on my own, with him I've managed 4 by myself! He's also helped me sort out my nutrition and find recipes that are nutritional and flavourful. My perspective on food has changed tremendously in the six months I've worked with him. James is very passionate about his work and it shows through the milestones he's helped me overcome, as well as the other clients in the group. He is exceedingly supportive of me and his group of clients, which he communicates with regularly through the client group. He's there for us for any question, however trivial or complicated it may be no matter the time of day. Despite my constant whining, I'm so grateful I clicked on that wonder woman ad I saw on Facebook. He got me off my plateau and helped me reach new heights. When I started training with James I’d been stuck in a rut for a long time. I’d put on weight since having a baby and never really felt comfortable in anything I wore. I’d managed to lose a bit on several different diets but it always went back on again and I lacked the confidence to join any exercise classes as I felt intimidated by the other women. 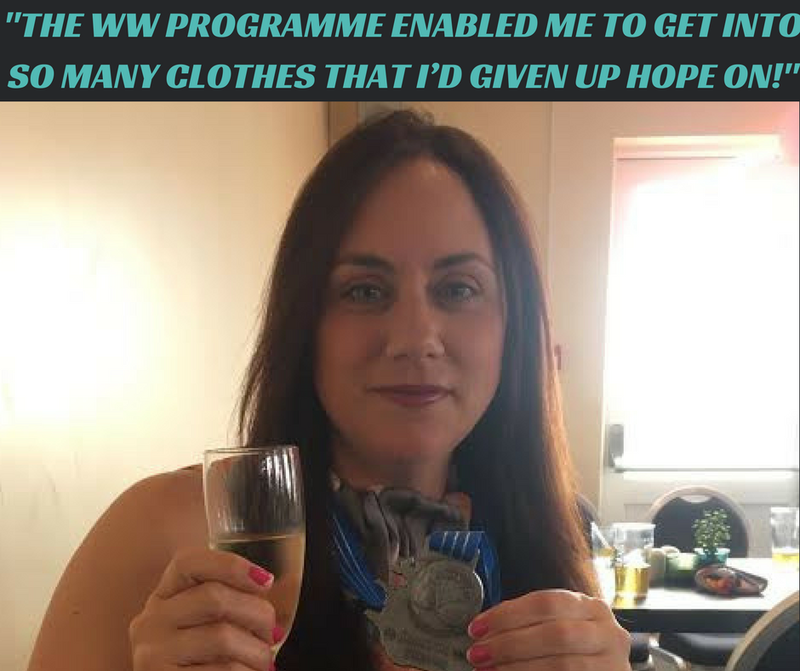 I’d signed up to walk a marathon in support of breast cancer with my sister and had a big family wedding in the summer and was desperate to get back in shape for both these events, so I contacted James after seeing his advert for the 8 week Wonder Woman programme on Facebook. I started training 3 times a week and, after discussing my diet with James, made a few tweaks to increase my protein intake and decrease the number of calories I was consuming each day. I won’t lie – the first week hurt! But I soon got into the swing of it and I made steady but constant progress. In 8 weeks I lost just under 1 stone and was able to get into so many clothes that I’d given up hope on! I went on to walk the marathon in just over 7 hours which was a remarkable achievement for me. The daily ‘check-ins’ were an invaluable tool for staying on track and to get reassurance from James when facing ‘wobbles!’. I have a tendency to really overthink things and James has a remarkable ability to ‘un-complicate’ problems! I wouldn’t hesitate in recommending James’ program – it has worked for me, and it can work for you too! "